M-22 is the famed highway that traces the outline of Leelanau County, curving along Lake Michigan, ascending farm-covered hills, and stretching through dense forests. 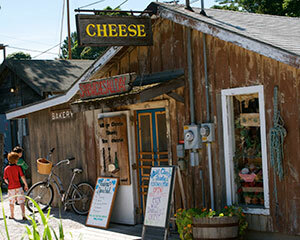 It also travels through the picturesque towns of Leelanau County filled with unique shops and Northern Michigan restaurants. Turn up the radio and follow the county’s main artery to these idyllic hamlets. This town showcases its Polish roots during the Polka Festival, held in July each year. But drop in anytime to browse its art gallery, quilt shop or yarn shop or pick up the perfect barbecue staples. Pleva’s Meat Market draws shoppers from all around for its award-winning cherry pecan sausage, and next door’s Cedar City Market provides the libations. Bunting’s Market offers smokehouse goodies and groceries. Wildlife watchers love Victoria Creek’s current, so slow that you can paddle the 3.5 miles to Lake Leelanau and back, listening en route to loons and watching the sunning turtles and fishing herons. The Sleeping Bear Dunes National Lakeshore (park headquarters is located in the lakeside hamlet of Empire) was recently voted the Most Beautiful Place in America by viewers of Good Morning America. No surprise, then, that its wide sandy beaches and the coastal bluffs deliver some of the lakeshore’s most stunning views. Discover culinary delights in the Joe’s Friendly Tavern, which highlights organic vegetarian delicacies and Grocer’s Daughter Chocolates, often named among the best in America. 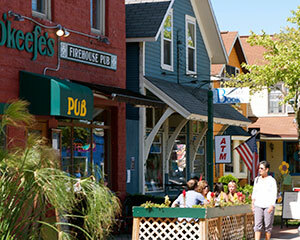 Situated on a small strip of land between the Glen Lakes and Lake Michigan, Glen Arbor thrives as an iconic resort town. Glen Arbor is surrounded on all sides by Sleeping Bear Dunes National Lakeshore, providing easy access to popular spots like the Pierce Stocking Drive and Pyramid Point. Cottages perch along the turquoise blue of Glen Lake, and the town bustles with resort town fun—outdoor patios brought to life with live music, beach shop souvenirs, art galleries and the “world headquarters” of Cherry Republic, a tourist draw in itself that sells 100-plus items crafted from cherries. Situated along the narrows—the channel connecting North Lake Leelanau and South Lake Leelanau—this tiny town is home to remarkable vacation treats: a popular century-old resort called Fountain Point, a new wine tasting room on the water, an elegant Italian restaurant, farm stands, boat launch and some of the county’s winery favorites. Labor Day weekend brings an annual blues music festival. Tourist town meets fishing village in Leland, where upscale galleries and boutiques blend seamlessly with the harbor area called Fishtown—wooden docks with cedar-shake fishing shacks repurposed as souvenir shops and food stops. No stay’s complete without a pretzel bread sandwich at the Village Cheese Shanty or a sip of a Chubby Mary enjoyed at The Cove, along Leland’s river. Catch a charter fishing trip or a ferry to the Manitou Islands here. Originally called Pegtown Station, Maple City got its start as a shoe peg factory on several acres of maple timber. Tucked into the hilly countryside, this small town is home to the eponymous Pegtown Station restaurant (acclaimed pizza) and a classic small town grocery with on-site smokehouse. 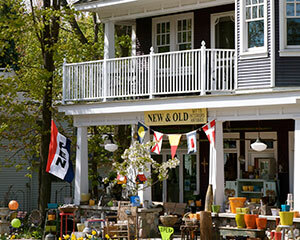 One of the area’s earliest settlements, the town perched at the northern tip of Leelanau County now houses art galleries, antique shops, restaurants, an independent book store, rock shop, coffee shop, addictive bakery and new restaurants. Boaters love the harbor, visitors the surrounding vineyards and orchards, state park and beaches. Annual summer events include a classic fish boil, fishing derby and classic car show. Blink and you’ll miss it, but that’d be a shame. This curve-in-the-road village boasts a U-pick flower garden, sweet sandy beach, notable art gallery, a pub that serves delectable fish and chips and has an adjacent winery tasting room. This waterfront village teems with life come summer as visitors explore galleries, boutiques, restaurants, art theater and historic inns or head to the waterfront park for a day at the beach or festivals centered around art, food and wine. Midway up the Leelanau Peninsula, the town is near several wineries and bookends the Leelanau bike trail, which stretches 16 miles to downtown Traverse City.